Assuming you read Ed Friedrich’s story you know that construction on a new Manette bridge could begin in July. The old bridge won’t be gone until 2012 or 2013, but a new path is coming. The picture here is one I took one day from the bridge. In the more than seven years I have worked for this paper, I never had walked it before. 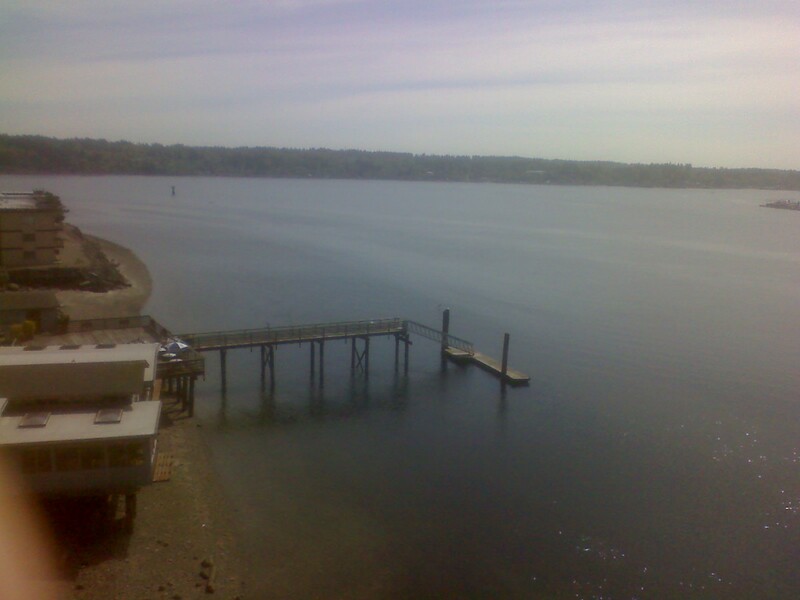 My first three years were in Poulsbo covering Bainbridge Island, so I deserve some slack there. But one day a few weeks ago I had walked to the fountain park during my search for profanity and the air temperature was neither too cold or too hot. I didn’t have something desperately awaiting my attention back at the office, so I decided to make the walk I always said I wanted to do. For the record, I did cross the Warren Avenue bridge some time ago. Like so many places here, the view from the bridge is spectacular. This picture, taken with my cell phone, doesn’t come close to doing it justice. In 2013 that view will remain. I’m sure the walk will continue to be wonderful. The view of the bridge will be vastly different. The kind of picture Larry Steagall took with Ed’s story won’t be available when the green goes down. State Rep. Sherry Appleton, D-Poulsbo, had at one time questioned whether the steel pieces that give the bridge character could be maintained as a facade. It’s possible that it could be, from what I remember a state transportation telling me. But it would cost more. Given tight dollars these days, the state sure wouldn’t pony up the money. If one of you wins a lottery, a really big one, I’m sure you could at least pay for an audience. During that walk I saw that it was dedicated on June 21, 1930. With a little research I’ve found that the only person born in Kitsap County on that day died 30 years ago, but still has at least one relative living nearby. I still haven’t tracked down the whereabouts of the girl given the honor of dedicating the bridge. She’d be in her 90s now. If you have never taken the walk over the bridge, I’m one who would recommend it, especially because a deadline looms. In this business we know all about deadlines.